I know I’ve been doing a lot of salted caramel things lately. You’re here for it though, so I guess you like it too! Yay! I can’t remember what sparked me to make this… but here it is, existing and prospering like a puff pastry should. It starts with good store bought puff pastry (please feel free to make your own, I’m not that cool yet). I recommend trying to find “all-butter” puff pastry (Trader Joes has a good version), vs. the other stuff that’s mostly hydrogenated soybean oils and such. All-butter is always all-better. Next, the pastry cream. It’s basically fancy homemade pudding that’s pretty easy to make from scratch, just read the technique in the directions to become familiar with the steps, there are a couple of steps where you have to work quickly. However…I would not be mad at you (okay, a little mad on some “c’mon just try ittttt, it’s easy!” but not like “ugh I hate bell peppers!” mad) if you wanted to take a shortcut and use Jell-O Instant Vanilla pudding out of the box. Read the package instructions for “pie filling” (not pudding – filling usually requires less milk), but before following the package instructions, steep the Earl Gray tea in warm milk for one hour, then continue with the rest of the package instructions for pie filling. 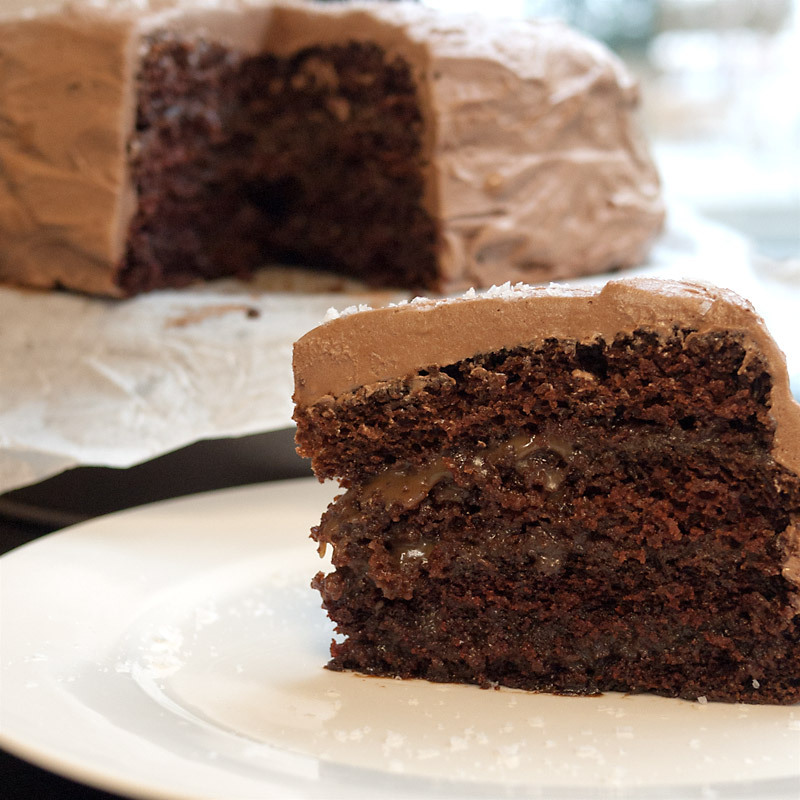 It’s better homemade though… just saying. Finally, the salted caramel sauce. 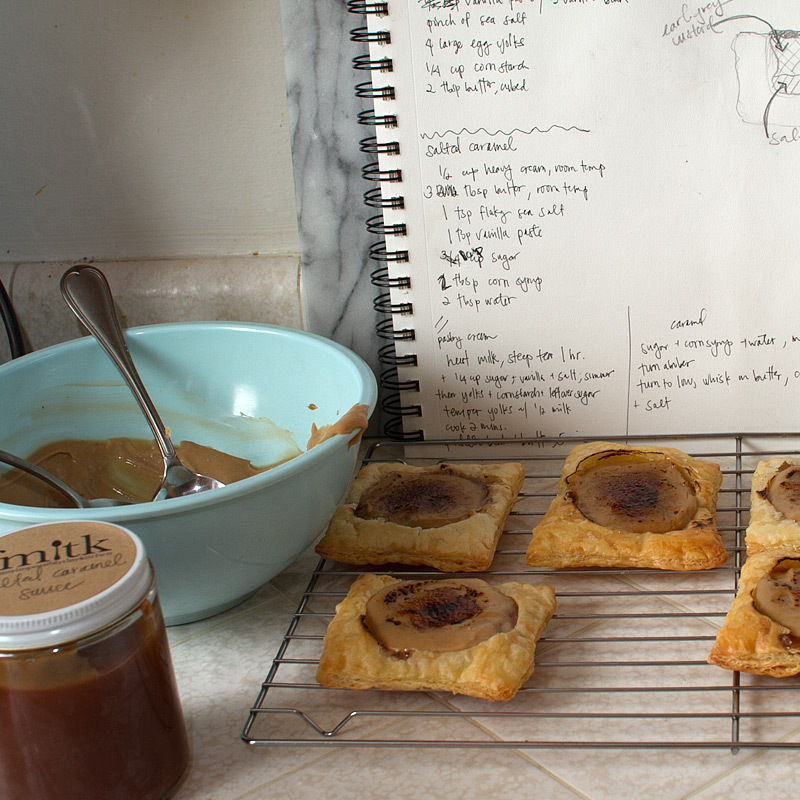 This recipe makes WAY MORE than the required amount for the pastries. And you are SO welcome. *curtsies* Keep it in a jar and spread it all over your life. I knooooooow it looks like a lot of steps and super complicated but really, it’s just a bunch of small easy steps. The complication is minimal if you just take it one little step at a time. 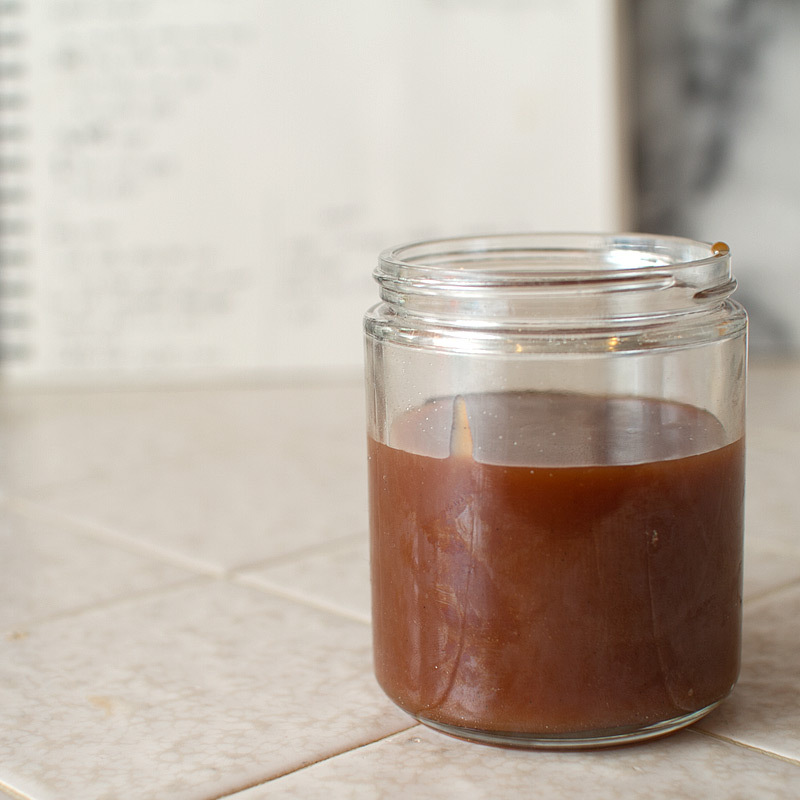 Just make sure you have everything in place before you start so you’re not scrambling around the kitchen looking for the heavy cream or a jar to pour the caramel in. 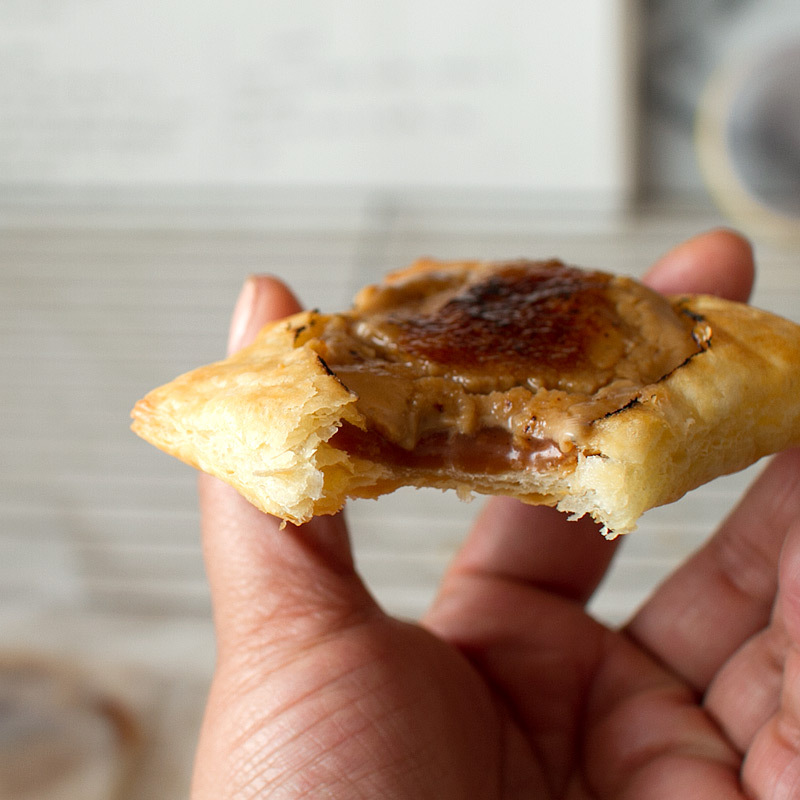 Make the pastry cream first since that needs time to chill, then the salted caramel. 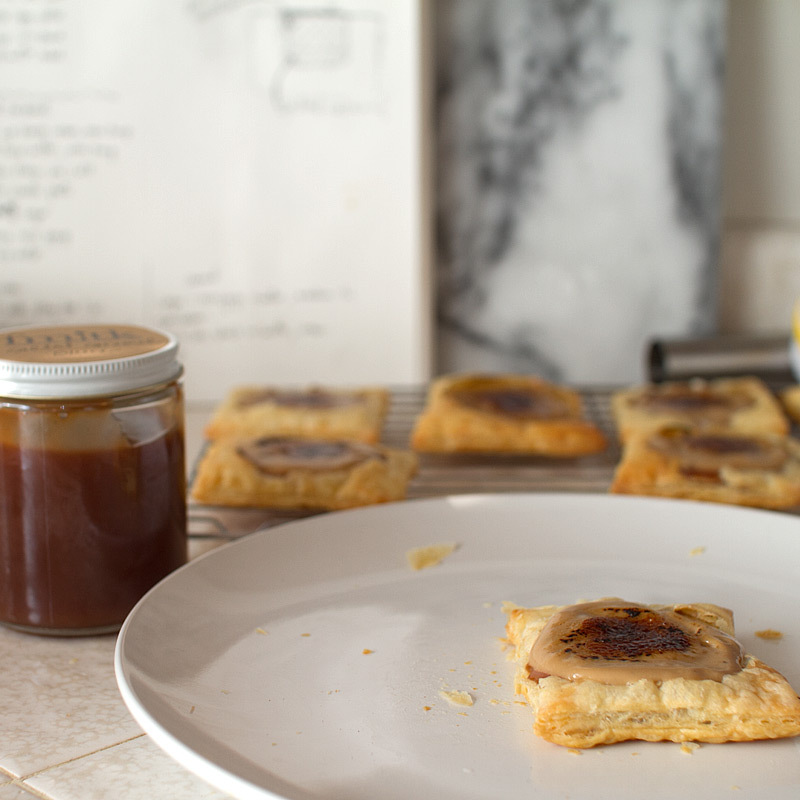 The pastry cream can even be made a couple of days ahead of time, as well as the caramel, if you’d like to space out the recipe over a couple days. Let’s start with the pastry cream. 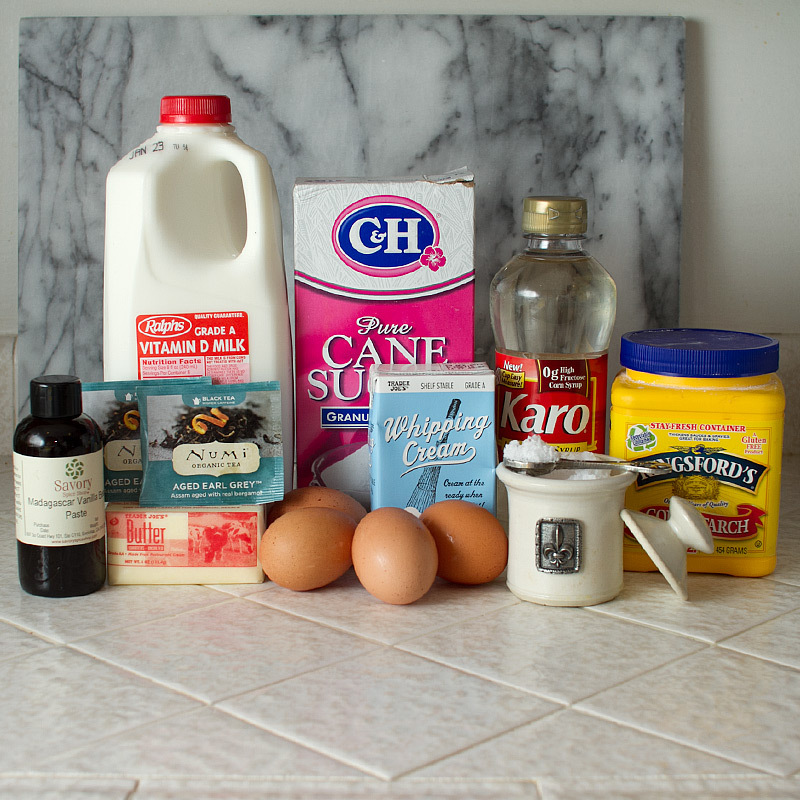 You’ll need milk, sugar, cornstarch, sea salt, egg,s heavy cream, butter, Earl Grey tea and vanilla paste or extract. (Ignore the corn syrup that’s in the back photobombing). Warm the milk and steep the Earl Grey tea for one hour. After the milk has been Earl Grey’d (yes, I made that a verb), add in 1/4 cup of sugar, vanilla paste and sea salt. Bring to a simmer. In a medium bowl, combine the egg yolks, remaining 1/4 cup of sugar and cornstarch. Now we’re going to temper the eggs – that basically means gradually add in hot liquid to the cold yolks. “Gradually” being the operative word – do it to fast and you’ll have Earl Grey flavored scrambled eggs. Womp. Add in 1/2 cup of the warm milk at a time, whisking constantly, until all the milk has been incorporated. Return the tempered eggs to the saucepan and heat over medium, stirring constantly, until it thickens – about 2 minutes. Now, if you pulled a Holly and had the heat up a little too high and didn’t stir as much as you should have, you might end up with a scary lumpy mess. It’s okay. The hand blender will whip that pastry cream right into shape! Add in the butter and beat until the butter has melted and the mixture cools down – about five minutes. Chill the pastry cream (covered with plastic wrap directly on the surface to prevent a skin from forming) for at least two hours. After it’s chilled it’s super thick and not very spreadable (top image) – just give it a good whisk and it’ll be light and creamy again. Yay! You don’t have to re-whip until ready to fill the puff pastry so just let it chill in the meantime. 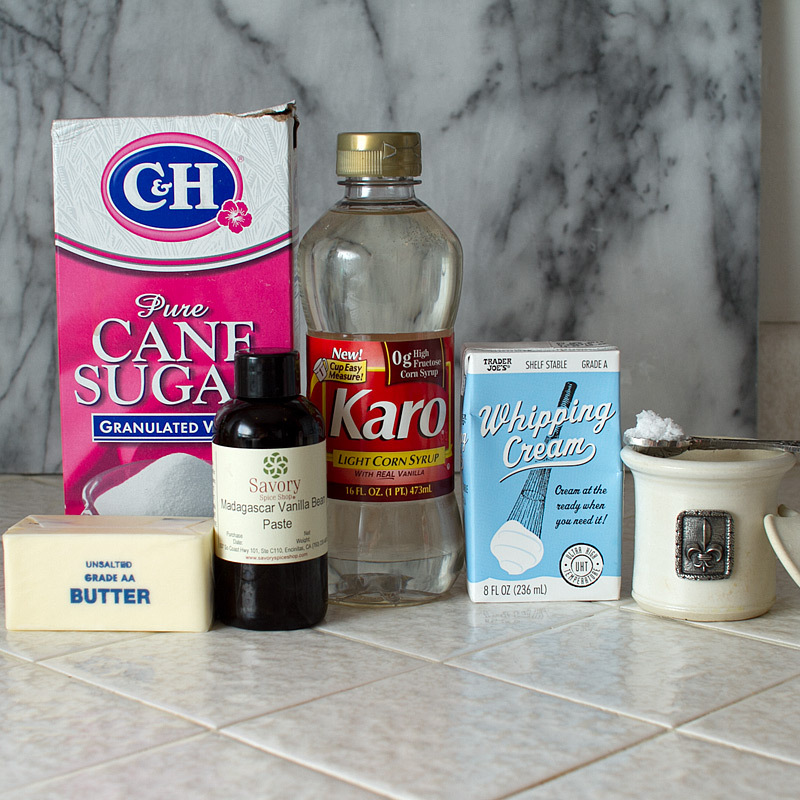 You’ll need sugar, corn syrup, heavy cream, sea salt, vanilla paste or extract and butter. Warm the heavy cream and butter in a microwavable safe bowl until the butter is mostly melted – about 45 seconds. Add in the vanilla paste and set aside. 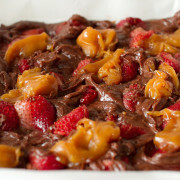 Combine the sugar, corn syrup and water in a medium sauce pan over medium-high heat until it becomes an amber color. 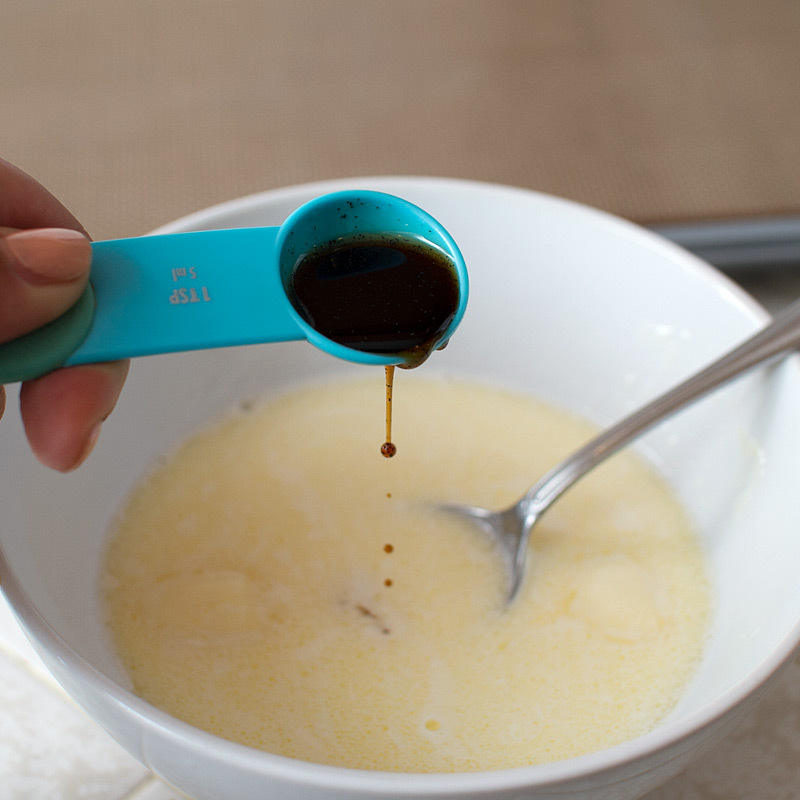 Gently swirl around the pan to prevent any hot spots where the sugar could burn. Don’t stir with a spoon – it can cause the sugar to crystallize. Just swirl it around gently until the bubbles get small and the color is amber-ish. Don’t try to multitask, either – watch this like a hawk. 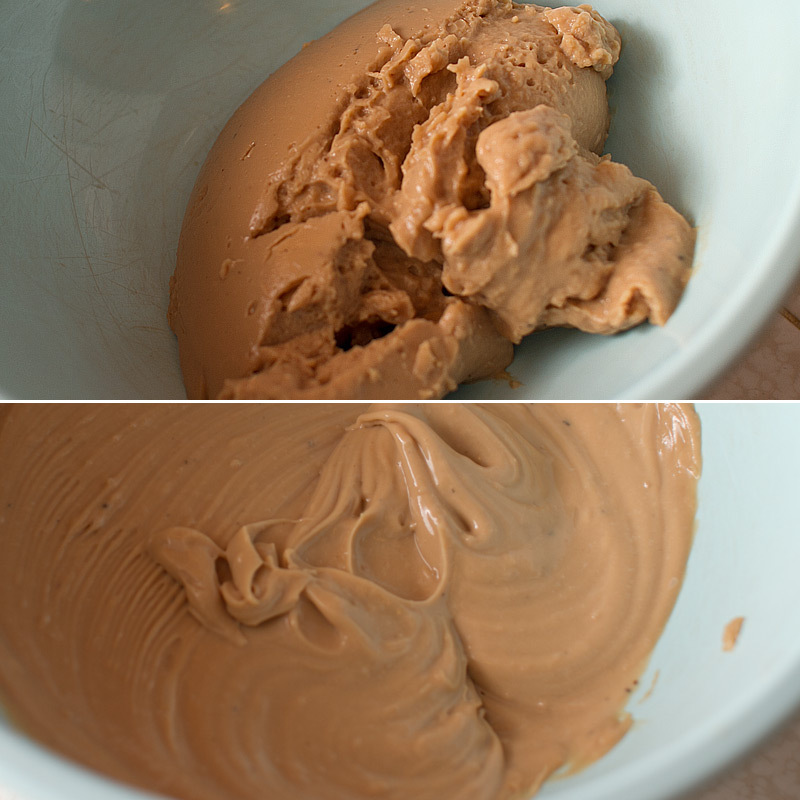 Once the amber color has been reached, whisk in the warm cream mixture. Be careful, this will give off a lot of steam and bubble up quite a bit. Whisk in the sea salt. Place in a heat proof container – preferably a jar with a lid. Leave uncovered until completely cool. Let’s get into that puff pastry now. 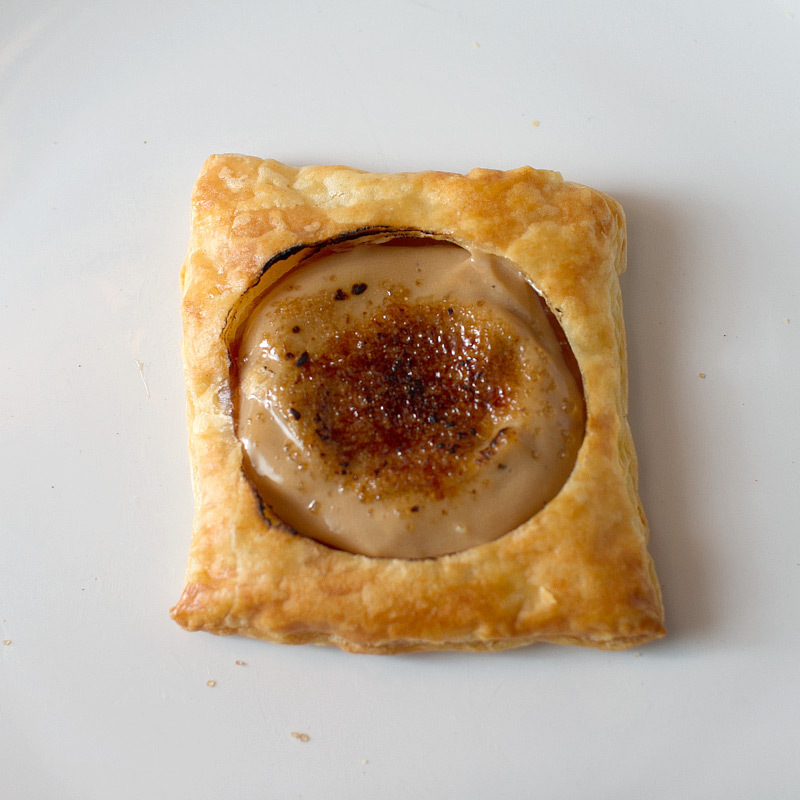 I used Trader Joe’s Frozen Puff Pastry, which comes in 10″ squares. 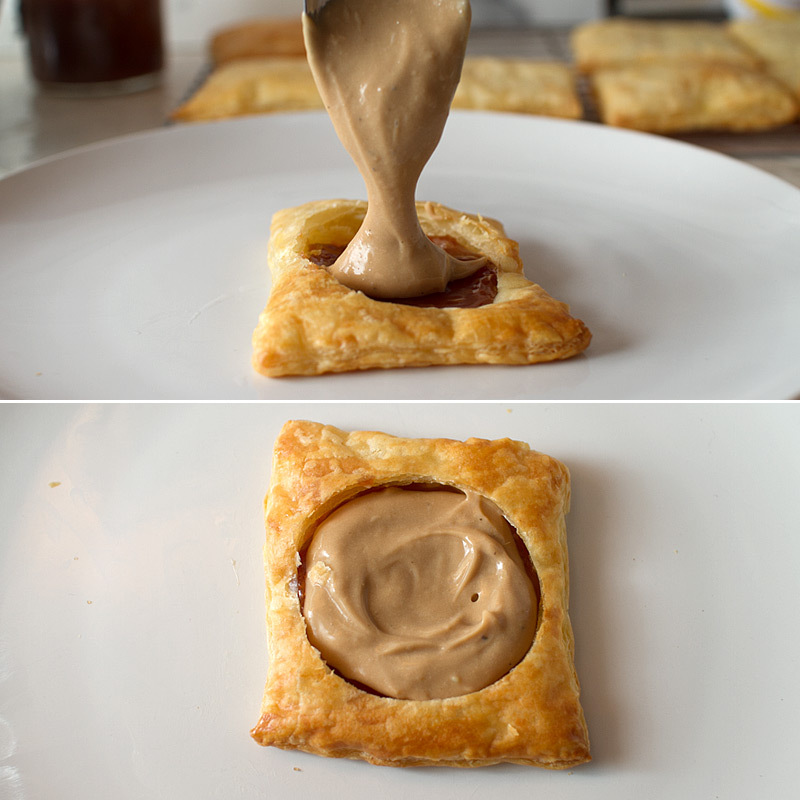 Whatever size your puff pastry, cut into 9 squares. Using a cookie cutter (2″ cutter for 3″ squares, large cutter if your squares are larger), make an indentation into each square, taking care not to push all the way through. This will act as a guide to punch a hole into the pastry when we fill it with nommyness later. Bake at 375F for 12-15 minutes, until puffed and golden brown. Let cool completely on a wire rack. 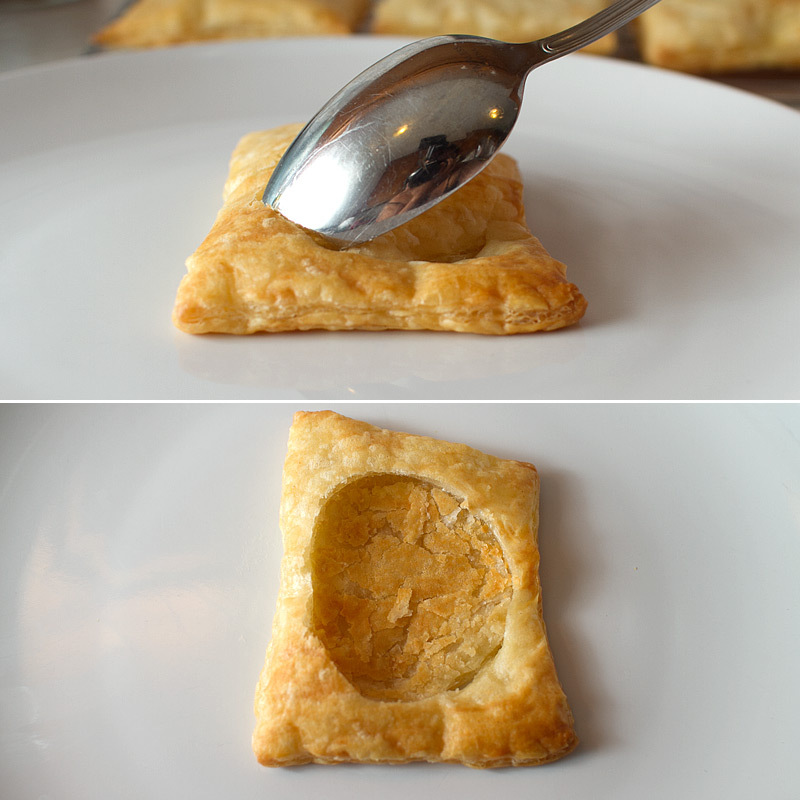 Using a spoon and the circle indentation as your guide, gently push in the puff pastry to create a pocket. 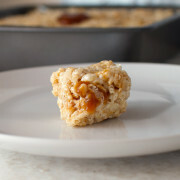 Fill with 1/2 tablespoon of salted caramel sauce. Swirl the pastry around to make sure the bottom is evenly coated. 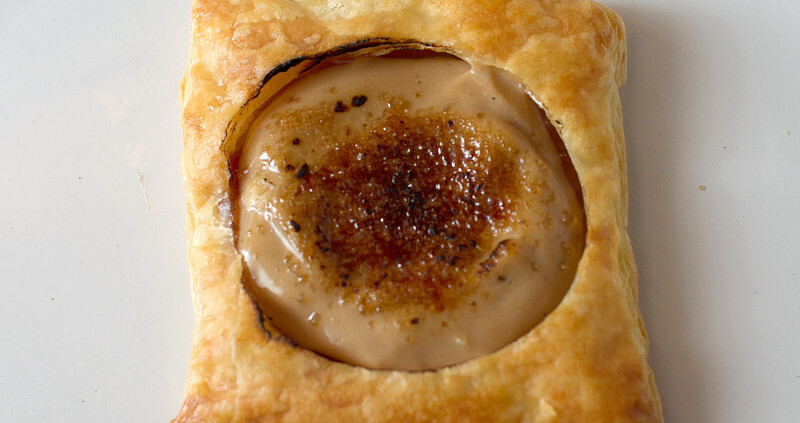 Top the salted caramel with a good tablespoonful of the Earl Grey pastry cream. This is the funnest part evoooor. Add about a teaspoon of sugar to the top of the pastry cream. With the flame on low, brûlée the top until the sugar has melted and caramelized. It happens pretty quickly. 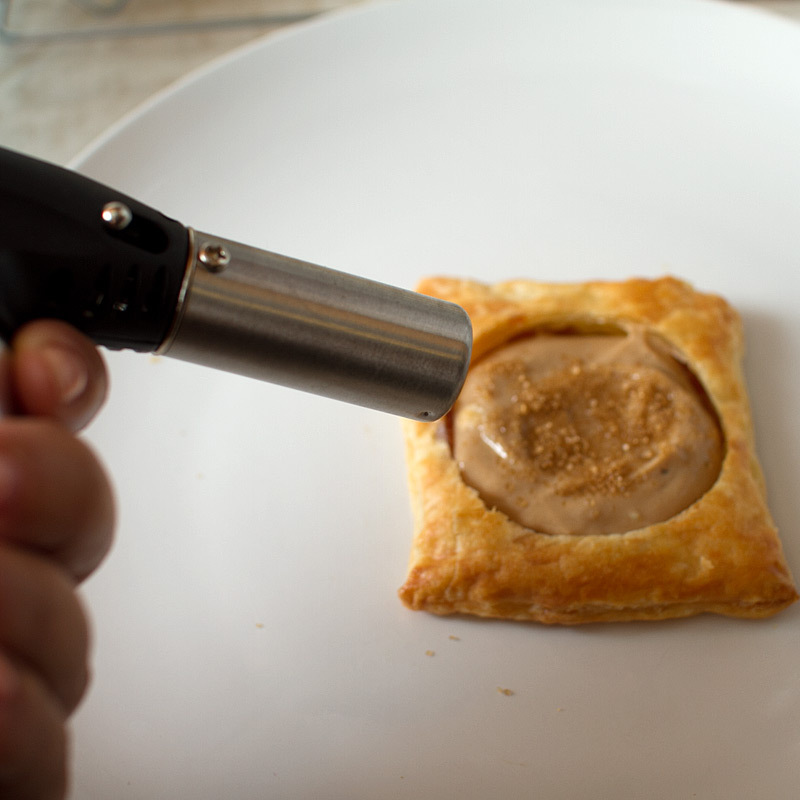 Take care not to burn the pastry itself. My assembly line of pastry. Shameless possibly future FMITK product plug. 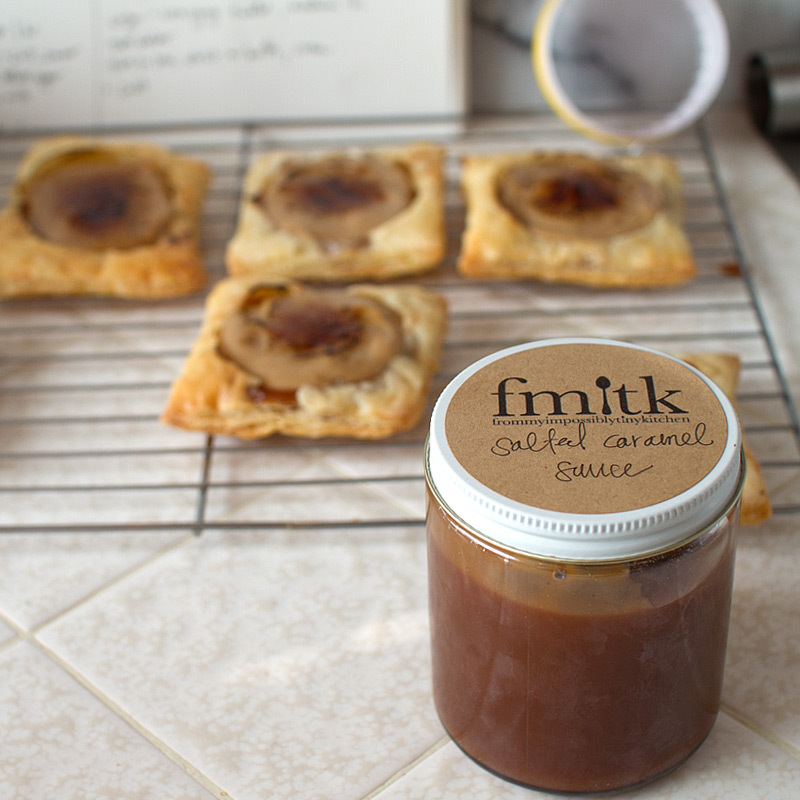 Salted Caramel Earl Grey Creme Brûlée… Things. 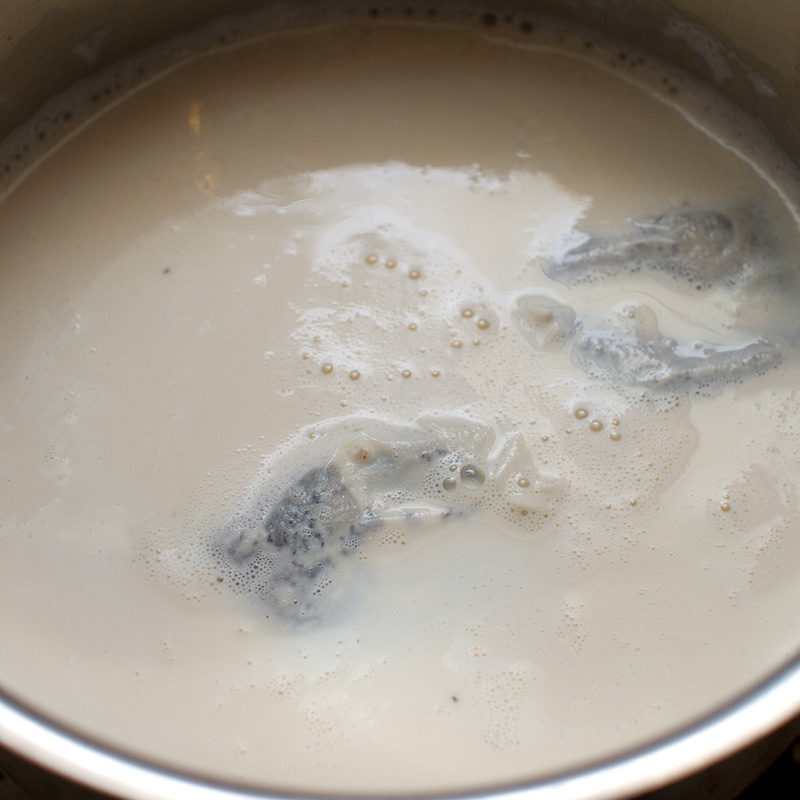 In a medium sauce pan, heat milk over medium heat until it begins to steam. Don’t let it boil. Add in tea bags and remove from heat. Let steep for one hour. 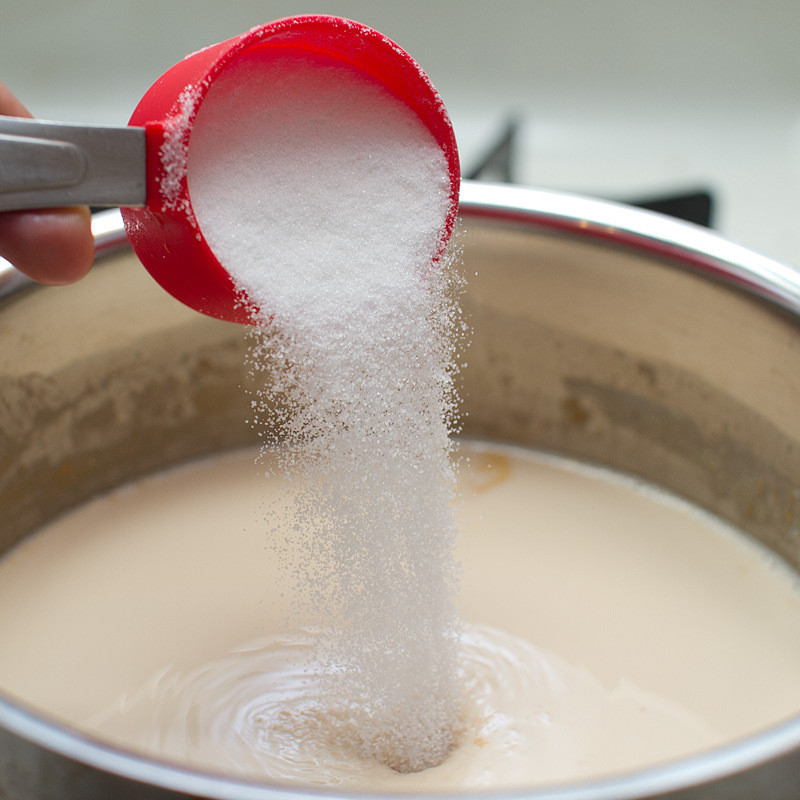 Add 1/4 cup of sugar, vanilla paste and salt to the milk and bring to a simmer over medium heat. 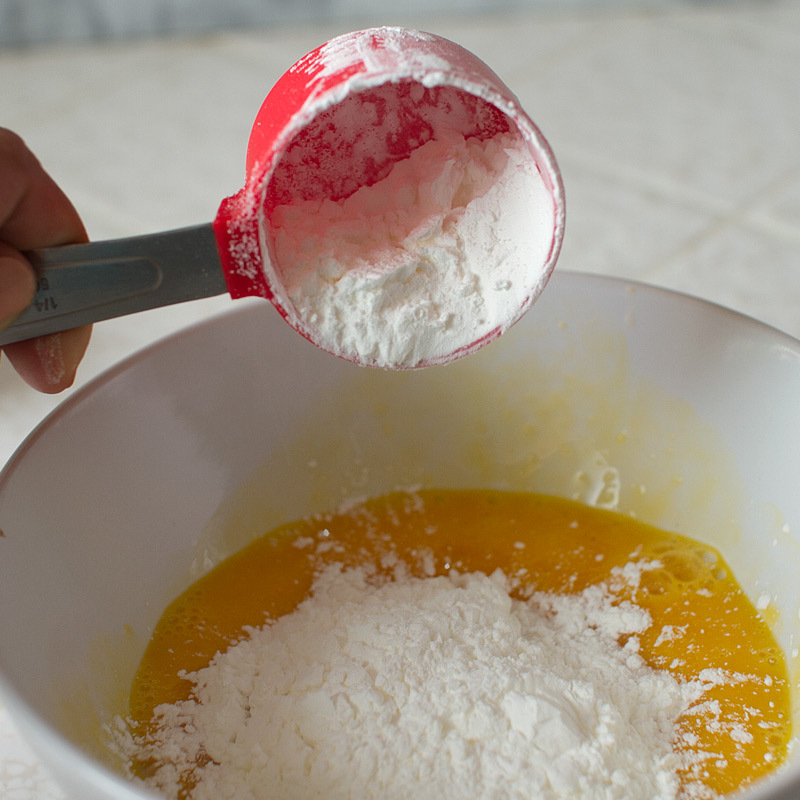 In a medium bowl, whisk the egg yolks, corn starch and remaining 1/4 cup of sugar. While whisking constantly, add in the warm milk mixture, 1/2 a cup at a time, until fully incorporated into the yolk mixture. Return the mixture to the sauce pan and place over medium high heat. 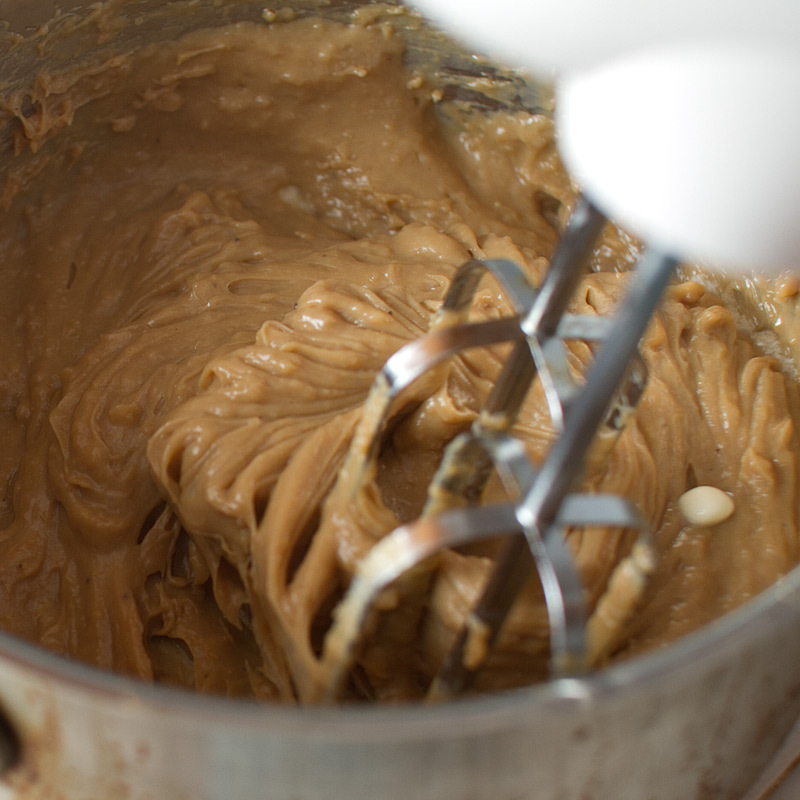 Whisk constantly as the mixture thickens – about two minutes. At this point the mixture may look a little lumpy and ruined, it’s okay – we’re going to beat it into submission. Transfer the mixture to medium bowl and add in cubed butter. Using a hand mixer (or a whisk and the best elbow grease ever), beat in the butter until full incorporated and the mixture cools down – about five minutes. Cover with plastic wrap, being sure that the plastic wrap is directly on the surface of the pastry cream to prevent a skin from forming. Chill for at least two hours. This will keep in the refrigerator for about 3 days. Right before you’re ready to use the pastry cream, whip it with a hand mixer or a whisk. In a microwavable safe bowl, combine cream and butter and warm until butter is just melted – about 45 seconds. Stir in vanilla paste or extract and set aside. In a large sauce pan, combine sugar, corn syrup and water. Heat over medium-high, swirling the pan around occasionally to prevent any hot spots from occurring. Don’t stir with a spoon – this can potentially create some crystallized sugar and mess your whole game up. Just swirl the pan around gently. 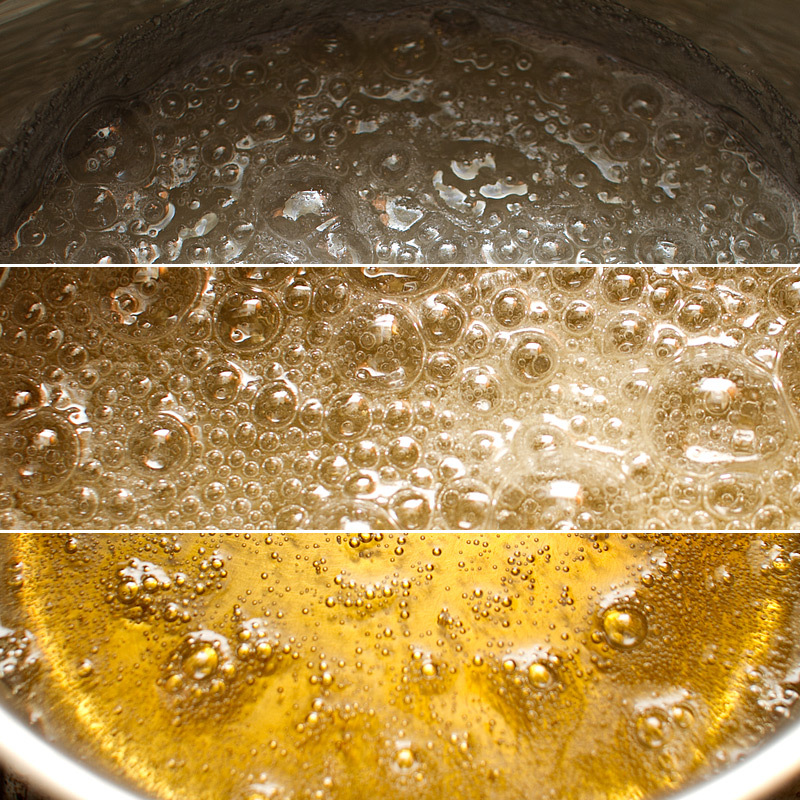 Boil the sugar mixture until it becomes an amber color – you’ll see the bubbles get smaller the closer it gets to amber. This happens quickly, so keep an eye on it. 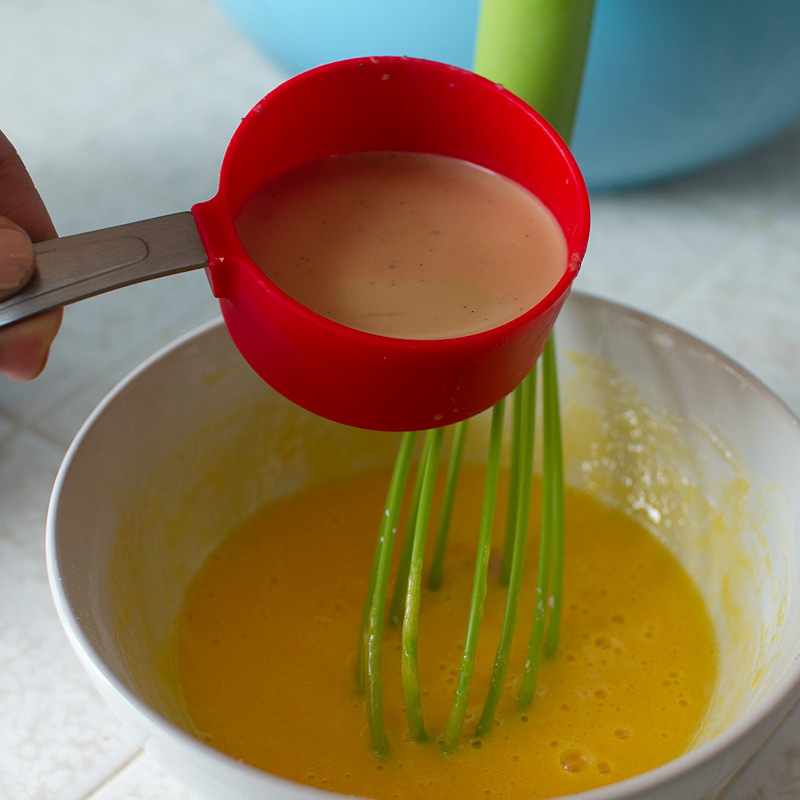 Once amber color has been reached, turn the heat to low and whisk in the warm cream and butter. 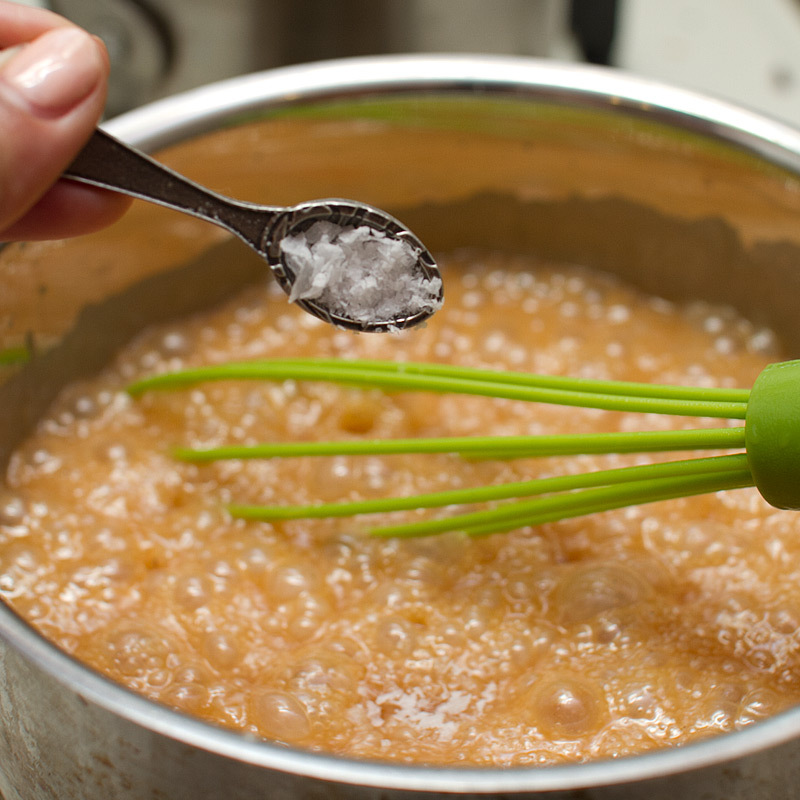 Whisk constantly to prevent crystallization and lumps. Whisk in sea salt. Place in a heat-proof jar (glass with a lid, preferably) and let cool completely before placing a lid on top. Don’t eat it all. Yet. 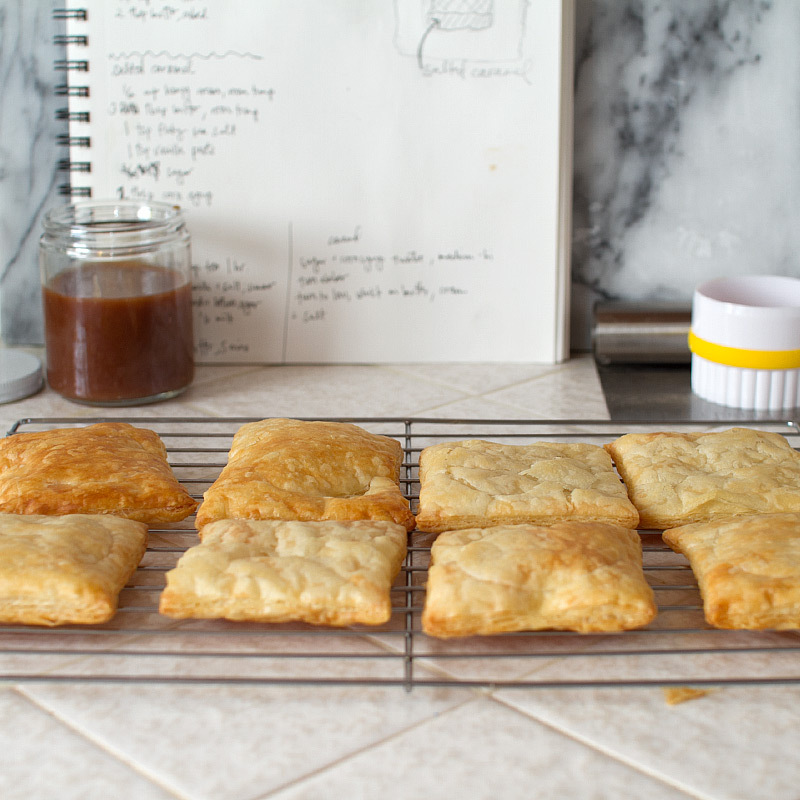 Cut puff pastry into 9 squares – my pastry was 10″x10″, which resulted in ~3″ squares. 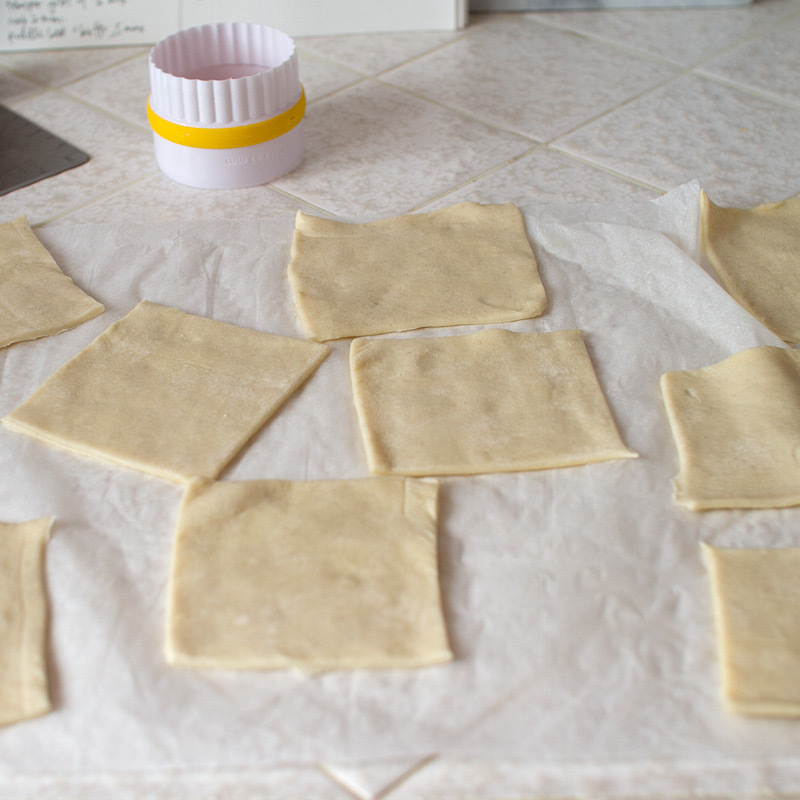 Spread the squares of puff pastry on a parchment paper lined baking sheet, leaving about 1″ in between each. 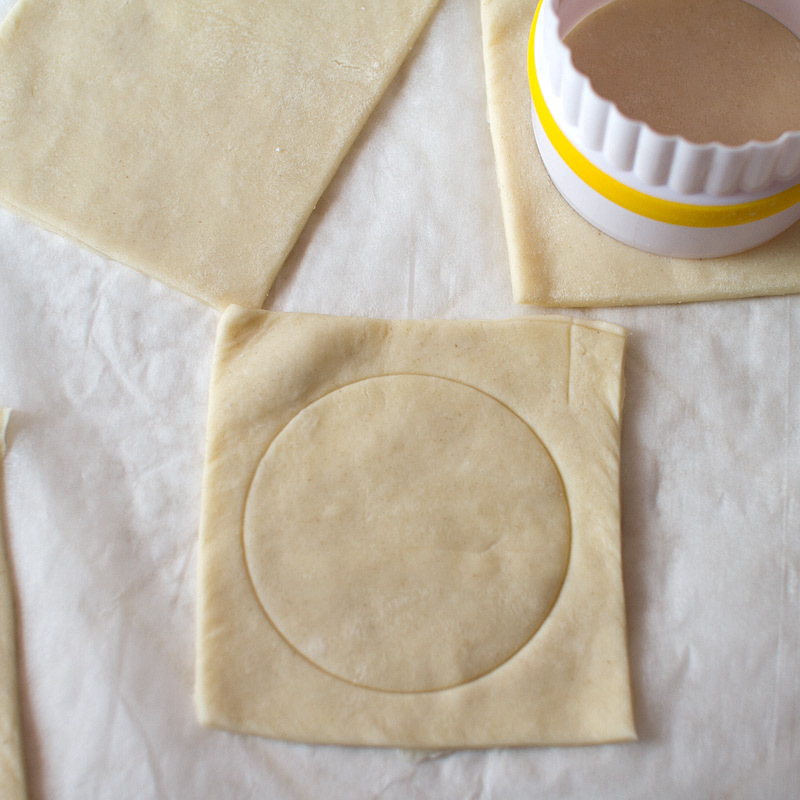 Depending on the size of your squares, use a 2″ – 3″ round cookie cutter to indent a circle into each square (there should be a 1/4-1/2″ border around the circle, these will be the “edges” of the pastry. Bake until golden brown, about 12 – 15 minutes. Let cool on a wire rack. Using a spoon, gently push in the center of the puff pastry, using the indentations made with the cookie cutter as your guide. 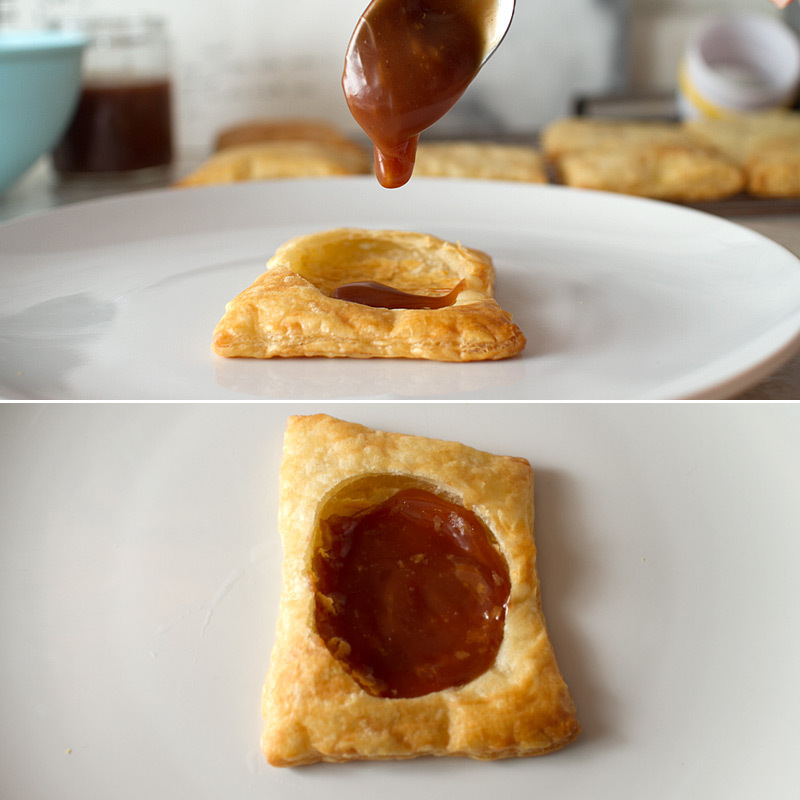 In each little pastry puff indentation, add about 1/2 tablespoon of the salted caramel and spread evenly across the bottom (use more caramel if your pastry squares were larger than 3″). Top with 1 tablespoon of the Earl Grey pastry cream. 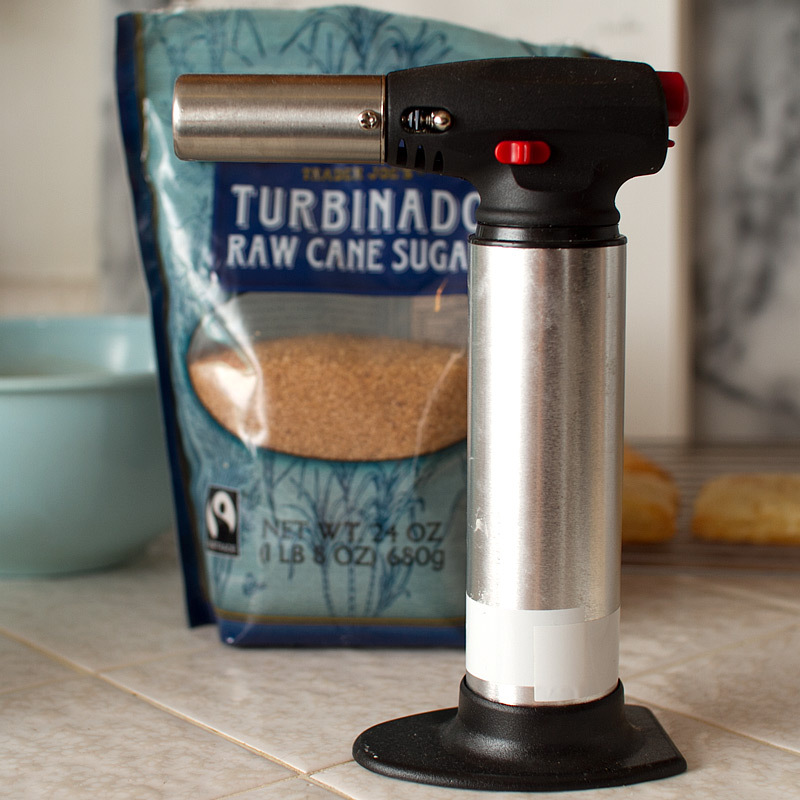 Sprinkle the top with the turbinado sugar, then (YEEE!! the fun part) brûlée the top of the sugar (taking care to keep the flame on low as to not burn the pastry) until browned. The sugar will get crunchy as it cools.